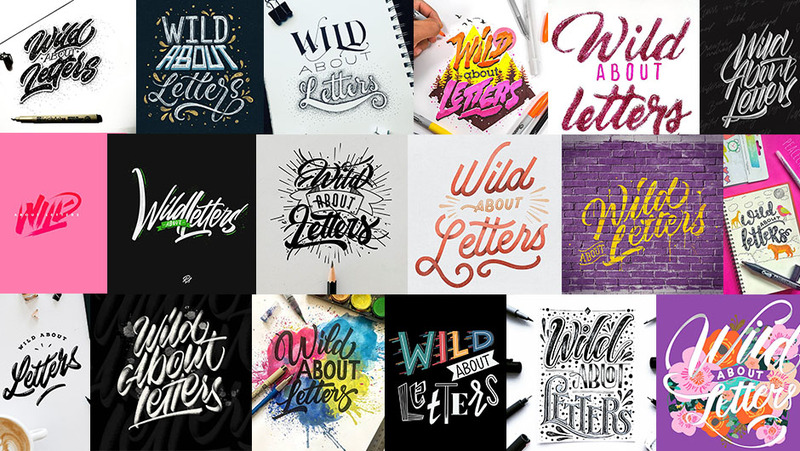 18 lettering artists tell us why they are #wildaboutletters! Home Typography & Lettering Community Blog General 18 artists tell us why they are #WildAboutLetters! Everyone comes from a different background and we all have a powerful message we can share with each other. 18 artists from all over the world share their raw stories on how they got involved in their creative journey of typography and hand-lettering. Remembering like it was yesterday when I bought my first markers and spray cans in these little graffiti stores in my hometown. Hanging out with the cool guys they said was dangerous. For me it was way more exciting then anything else at this time in my life. What they did was inspiring to me. All day long they were talking about letters and drawing them on paper and in these so called black books or anything they could find. I was hooked from the start. At this time I did nothing else other then trying to figure out how to improve my skills with the letters. I was always fascinated in how many different ways you could say something with just putting words together – and tell a message on walls, on paper or even on trains. Millions of sketches later around my mid 20s I stopped doing graffiti. I needed almost a 10 year break to get back on track. Less then a year ago, I discovered hand-lettering and type design which caught my attention straight away. Since that moment I’ve been creating and learning each and every day. And this is where the idea of #wildaboutletters got its identity from. The idea behind this is to bring together the passion about letters in all their forms and beauty. It might even go further – there is always a story behind the piece but also a story behind the artist! Our backgrounds are so different as are our styles of letters. I would love to bring this together. Your story and your art matter! Growing up I always loved drawing “fancy” letters and creating art out of words, whether my own drawings, cutting letters out of a magazine and gluing them together, or mixing fonts around in Word to make a document look a little more interesting. There was a point in my childhood that I wanted to be a teacher, but my sole motive was so I could write on the chalkboard….or other times, I wanted a job where I could just fill out forms all day. Why? Because I loved to write. I took pride in nice handwriting and was one of those people that LOVED a brand new notebook or journal to get a fresh start to “write your very best”. In June 2016, I discovered the lettering community on Instagram and was shocked. I had no idea it existed, that it was so huge, and that so many people loved the alphabet as much as I did. This opened a whole new world of opportunity for me. To bring back my love for letters, to take on various lettering challenges and to learn from some of the best. This community is truly something special – it’s full of so many talented and awesome people that make me more #wildaboutletters every single day. Since I can remember, drawing has been a big part of my personality and I was lucky to feel that passion for illustration from an early age, soon becoming my vocation, my career and my life style. In 2004 I graduated college and got my Bachelor’s Degree in Graphic Design. Right then, I decided to move abroad and go to Europe to learn about life. I lived in London for almost 4 years and then life brought me to Miami, Florida to start a new chapter of my life and to fulfil my dreams. I’ve been living in sunny Miami for the last 10 years and I can’t be any happier. They say that something good always comes out of bad things… My journey with letters started when my mom got sick… Working on the computer was no longer an option, so I started writing and drawing letters with positive messages to make her feel better, think positive, be strong and to fight. My mom was the nicest person ever and I love her so much for everything she did for us. Every letter that I put on paper has a little bit of her in it! It has been about two years since I started playing with letters every day, I am grateful for all you guys for inspiring me and making me grow as an artist. My mission is to make other people around me see the beauty of letters! Thank you @ritchietype for creating this! Cheers everybody! When I started to enter college again, I met someone who shared the same hobby as myself, he is good at calligraphy and his name is @brandonnsp. I learned the skill through him, as I have not been taught directly just and not knowing the basic strokes, but continued to learn new things. So, I enter the calligraphy community named JKTYP. From there, I really learned a lot ranging from how to grasp the correct brush up how to write a nice look. After that I just started to learn the right calligraphy till now a hobby remains and may have been able to produce materially. This is my story. I am a hand-lettering beginner, my journey in this world began six months ago, when I became addicted to watch lettering tutorials. Since then I have practiced every day to improve my technique and find my own style. My story starts back in late 2010 when I started exploring the world of graffiti. That lasted up until 2016 when I discovered the art of calligraphy. Since then so many things happened in my life that quite frankly I wouldn’t be able to fit within this post. It all started loooong time ago when I was about 20 years old (OMG that’s… uhm… 25 years ago) As a child I always loved to draw and doodle and when I found out about a calligraphy course in my home town, I didn’t have to think twice! In that time I learned some basics about the art of writing, calligraphy, and my love for letters was born. After that I became a ‘mature adult’: a house of my own, a garden, a boyfriend (my future husband), a job (and a study). And a few years later I got married and became a mom of two wonderful boys. Being this busy as a wife, mother and working woman ‘me-time’ became scarce and I kind of forgot about how much I used to love writing/calligraphy. It was in march 2017 when I rediscovered my love for letters. A friend told me she was experimenting a bit on lettering, and I immediately knew: this is what I want to do again! I searched the internet for tutorials, examples etc. and found out about the huge number of talented artists, lettering communities and challenges on Instagram. You all surprised, inspired and taught me so much! I know I still have to learn a lot more (ok, I also try to remember it’s about the progress and not about perfectionism), but I love doing this and I’m so eager to improve my skills! Thank you all for teaching and inspiring me. I am very interested in lettering since August 2016 and until this day I feel like lettering is my passion that I have always been looking for. I am not a graduate of design school and have never drawn before, either it’s illustrations or lettering. I started lettering by learning basic calligraphy brush pen and learning about basic of typography. I think these two things are very important to develop my skill in lettering. I’ve been 2 years in the world of lettering, and for me, lettering is not only a medium for expression, but also a medium for relaxation. I find it hard to not lettering every day and share it in Instagram. Now, the lettering community in Instagram is growing very rapidly. Lots of new talents and inspirations, I became more enthusiastic because a lot of new works with a new style that is very good to be enjoyed. This makes me #wildaboutletters. Background @stefankunz bonus from #thegridslife. I started learning to write since February 2016 when I was 20 y.o. I didn’t know the difference between lettering and calligraphy. And I also don’t know the basic of making letters. I started learning to write with pencils and markers on paper for 3 months. Then I learned to use Crayola for 4 months. In early 2017, I switched to learning to use brush pen, like Koi, Sharpie, Tombow, Lyra, and Pentel. At that time, I started learning to create my own font. My first font called “Vendetta” sold well and it made me excited about making more fonts. 4 months running, finally I bought an iPad pro. I started using iPad in July 2017. I thought this was my passion. I work alone with my hobby. And I’ve been 2 years in the world of letters. Until now I’m still exploring my style and my calligraphy skills. This is my little story. Yes, I admit: I am #wildaboutletters. One year ago I started lettering and taught myself the most important skills. My interest rose more and more with every bad sketch I made and I wanted to get better and better. During university I missed drawing and painting so much! And at that time I was really surprised what happened, when I just switched off my brain and let creativity flow. Well, this still happens from time to time. Some time later I started my Instagram channel and oh my God it was so stunning, watching other artists drawing and painting their art. I really love this “giving and receiving” kind of atmosphere. By now #handlettering means so much to me. I really do it EVERY. SINGLE. DAY. Am I kind of addicted? YES! Sorry, not sorry. I love how you can put atmosphere in lettering designs (romantic, cute, modern, cool, serious) and I like any kind of quote anyway. At this point I’d like to get something off my chest: I want to thank you all for accompanying me on my way, thank you for following, supporting and most importantly believing in me! Thank you for your lovely comments and messages. Thank you for being here! When did you start? What keeps you on track? We would love for you to get involved and let the world know who stands behind your masterpieces – Tell us your story and why you are Wild About Letters! I started hand lettering in 2013, as a graphic designer,i needed to work on something other than what i would do for my clients. At that time Sean McCabe, Ian Barbard and Jessica Hische were my biggest influences. I would always wonder how they made these fancy lettering compositions ( now I know its all in practice). I am still learning and bought my iPad 9.7 last year. Lettering is not what I do full time but I enjoy learning new things about it everyday. I started my passion for letters and lettering in a university assignment. We had to make a phrase that the teachers gave us, and transform it into a lettering poster. From there, I began to follow in Instagram the best known lettering accounts, such as GoodType and some artists like Stefan Kunz and Ian Barnard. Then, seeing the endless possibilities that I gave on the iPad to do lettering and more, I decided to buy one. The rest is known history haha! Well I want to tell you my quick little story about how I joined to this journal of letters, well all start when I was at the university when I was in 3rd year, at that time I was in full practice of illustration focusing on concept art (character design, creatures, futuristic weapons, etc). I was practicing illustration about 3 years, fortunately in 2015 I found the master David Milan on Instagram, when I started watching his work, I told my self “Dude! this is kind of good, holy jesus this is insane! i would like to practice this a lil bit…” I didn’t have any idea what is going to happen later when I started practicing letters, at that moment didn’t know the differences between calligraphy and lettering. Well i just start full time practicing calligraphy middle of 2016, thanks to the internet i could find courses on the famous website @domestika, I took my first course there with the greatest master @joluvian. Since then I haven’t stopped practicing lettering and especially calligraphy. I would like to tell you more about this but I don’t want to bore you haha. Lettering has become a part of my everyday life and it’s definitely what I love doing! But this was not always so. In 2015, around Christmas time I guess, I came to know that there’s this thing called hand lettering after I stumbled upon the a lettering video by @seanwes and I started practicing the basics. Then on IG, I started looking for more posts on hand lettering and my mind was blown! So many amazing artworks! Started following @ianbarnard and the tutorials by @willpat helped a lot! Fast forward, started practicing and lettering full-time, been probably 2.5 years now and I’m so glad I started! Bought an iPad Pro last Christmas and lettering has been all the more fun and challenging at the same time! Can definitely say that I’m #wildaboutletters! Made on iPad Pro using @procreate, chalk brushes by @ianbarnard and used the grid builder set by @ianbarnard and @stefankunz to finalize the layout! It all started when I noticed that some of my classmates were already specialized in something about design, many of them in illustration. They spent the whole class drawing and creating cool stuff while I was just there, unable to advance in my portfolio because I never considered myself like someone good at drawing, I needed to be always on the computer to do something I liked. Two years ago, I went to work in a place where I always had free time. Like the new guy and still had no work to do, I couldn’t be wasting time. I spent all day on Behance, watching project after project of all categories, until I saw the works of David Milan and Davihero, which in my opinion, two of the great personalities of lettering. It was there that I fell in love in a specific branch of the design. I took advantage of my free time in my work to learn calligraphy day by day, buying markers, brushes and pens, writing on any sheet that was discarded by someone, I had lots of sheets in my locker just to write on them haha. I’m still learning and, if it were not for that job, where I was never put to work, I would not be complete in the field of design. Thanks to @ritchietype to create this cool idea and spread the love for the lettering. Hello there, Once upon a time in 2016, I was just scribbling around like any other day at work and soon it became a everyday activity for me. I would letter everything; right from work related stuff to my thoughts. I would reach my work place, finish my work for the day asap and start my daily practice… So I worked and I practiced ALOT. In 2017, I decided to make an Instagram account to keep a track on my lettering progress… and haven’t stopped creating ever since.. I create and I post. My motivation to create daily is usually my previous day creation and the only person I am in competition is with ME! How did I get into lettering? Let me tell you! So when i finally finished my thesis and graduated I had ZERO creativity in me, no inspiration, no motivation. So to combat that, I decided to get back into an old passion of mine, stenciling, graffiti and most of all drawing. And the creative flame sparked back on. At the end of 2015 I decided it was time to really challenge myself to learn something new. So on January 1st of 2016 I started a 365 challenge, a year-long lettering challenge that forced me to create a piece of lettering EVERY SINGLE DAY throughout this year. It was challenging at first, but after a couple of weeks it became a habit and a fun daily exercise! When the year ended, I completed the challenge and learned so much about letters. But most important, I got hooked on lettering. It turned into a hobby and a passion. And next to that, I really got into the lettering community on @instagram, which is an amazing community! And to this day, I still love it. I still learn new things everyday and I create something everyday, it being random doodles, a lettering piece, or the best: Client work! Getting into lettering gave back so much, it’s amazing! So yeah, pretty much Wild About Letters! The timing on this challenge was perfect, because I was searching for things to letter. So I had to go all-out on this piece! A bunch of different styles, some illustration and some added texture with a spray-can. This was fun to do! It’s very cool to read other artists backstories, to see how the artists who’s work you see on this platform daily, got into lettering! … everybody has a story to share and we can’t wait to read yours!